Jaw-dropping scenery, big skies, superb skiing, iconic National Parks, culinary excellence, world-class hotels. The province of Alberta, Canada offers all of these things and so much more. 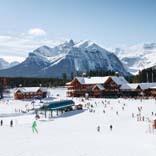 Ski Independence can create your perfect tailor-made ski holiday to Banff, Lake Louise and Jasper. We offer many styles of carefully selected accommodation, from self-catered condos to boutique and full-service luxury hotels, and with first-hand knowledge of the area we’ll make sure we find the right resort and the right property for you. Make the most of your Tri-Area lift ticket; spend a few nights in vibrant Banff and then head up to the tranquility of Lake Louise, getting deep into the heart of the Banff National Park. For something extra special, Jasper is located to the north via the spectacular Icefields Parkway. A pristine wilderness of staggering beauty, Banff is renowned for its restaurants, bars, shopping and sense of community. The town has a superb range of accommodation with something to suit every budget. The three ski areas, Mt. Norquay, Banff Sunshine Village and Lake Louise Ski Resort, are on the same Tri-Area lift ticket. 7 nights at the Banff Caribou Lodge & Spa from £1036 per person, based on 2 sharing a Standard Room (room only, with a free upgrade to a Superior Room), including flights with Air Canada from Heathrow to Calgary & shared airport transfers, departing 05Dec19. Book by 31 May 2019. 10 nights at the Fairmont Banff Springs Hotel from £1488 per person, based on 2 sharing a Fairmont Room (room only), including flights with Air Canada from London Heathrow to Calgary and shared airport transfers, departing January 2020. Book by 30 April 2019. Lake Louise offers the best scenery of any resort in North America. The Tri-Area lift ticket features Sunshine Village and Mt. Norquay as well as the Lake Louise ski area - tripling your fun and allowing you access to over 7,500 acres of terrain. 7 nights at the Fairmont Chateau Lake Louise from £1274 per person, based on 2 sharing a Fairmont Room (room only), including flights with Air Canada from Heathrow to Calgary & shared airport transfers, departing early December 2019. Book by 30 April 2019. 10 nights at the Lake Louise Inn from £1098 per person, based on 2 sharing a Standard Room (room only), including flights with Air Canada from Heathrow to Calgary & shared airport transfers, departing early December. Book by 31 May 2019. All our Lake Louise ski holidays include a shared scheduled coach transfer from Calgary, but the area is perhaps best explored with the flexibility of a self-drive car, SUV or minivan. We offer 'Gold option' car rental with Alamo and Avis which includes all taxes, fees, extra driver fees, fuel and ski rack. 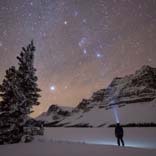 Located in the breathtaking, vast and rugged mountain landscape of Jasper National Park, this ski destination inspires lasting memories. The ski area of Marmot Basin offers 3,000 vertical feet of superb skiing. Jasper has managed to preserve a small-town feeling while still offering fantastic amenities. People greet you warmly, even though they’ve never met you and it doesn't take visitors long to feel part of the community…and find it hard to leave! Marmot Basin's newest terrain, Tres Hombres, offers an additional 367 vertical metres of expert terrain with trail names like 'No Fear' & 'Holy Guacamole'! 7 nights at the Fairmont Jasper Park Lodge from £1365 per person, based on 2 sharing a Fairmont Room (room only), including flights with KLM from Heathrow to Edmonton & shared airport transfers, departing early December. Book by 30 April 2019. 10 nights at The Crimson from £1093 per person, based on 2 sharing a Standard Room (room only), including flights with KLM from Heathrow to Edmonton & shared airport transfers, departing early December. Book by 31 May 2019. Take to the road! The stunning Canadian Rockies scenery and wildlife are the hallmarks of the classic Alberta itinerary taking in Banff, Lake Louise and Jasper. One client recently said "We loved the "off season" feel of Jasper... and the drive along the Icefields Parkway was a highlight rather than a chore." Call one of our Ski Specialists on 0131 243 8097 for further information & advice on booking your Alberta ski holiday now.